Most common adverse reactions (â‰¥4%) from clinical trials are blurred vision, burning and stinging, conjunctival hyperemia, foreign body sensation, itching, increased pigmentation of the iris, punctate epithelial keratopathy, and upper respiratory tract infection/cold/flu. (6). To report SUSPECTED ADVERSE REACTIONS, contact Bausch + Lomb, a division of Valeant Pharmaceuticals North America LLC at 1-800-321-4576 or FDA at 1-800-FDA-1088 or www.fda.gov/medwatch. Latanoprost Sterile Ophthalmic Solution is indicated for the reduction of elevated intraocular pressure in patients with open-angle glaucoma or ocular hypertension. The dosage of latanoprost ophthalmic solution should not exceed once daily; the combined use of two or more prostaglandins, or prostaglandin analogs including latanoprost is not recommended. It has been shown that administration of these prostaglandin drug products more than once daily may decrease the intraocular pressure (IOP) lowering effect or cause paradoxical elevations in IOP. Latanoprost has been reported to cause changes to pigmented tissues. The most frequently reported changes have been increased pigmentation of the iris, periorbital tissue (eyelid), and eyelashes. Pigmentation is expected to increase as long as latanoprost is administered. Iris color change may not be noticeable for several months to years. Typically, the brown pigmentation around the pupil spreads concentrically towards the periphery of the iris and the entire iris or parts of the iris become more brownish. Neither nevi nor freckles of the iris appear to be affected by treatment. While treatment with latanoprost can be continued in patients who develop noticeably increased iris pigmentation, these patients should be examined regularly [see Patient Counseling Information (17.1)]. Latanoprost may gradually change eyelashes and vellus hair in the treated eye; these changes include increased length, thickness, pigmentation, the number of lashes or hairs, and misdirected growth of eyelashes. Eyelash changes are usually reversible upon discontinuation of treatment [see Patient Counseling Information (17.2)]. Latanoprost should be used with caution in patients with a history of intraocular inflammation (iritis/uveitis) and should generally not be used in patients with active intraocular inflammation because inflammation may be exacerbated. Macular edema, including cystoid macular edema, has been reported during treatment with latanoprost. Latanoprost ophthalmic solution should be used with caution in aphakic patients, in pseudophakic patients with a torn posterior lens capsule, or in patients with known risk factors for macular edema. Reactivation of Herpes Simplex keratitis has been reported during treatment with latanoprost ophthalmic solution. Latanoprost should be used with caution in patients with a history of herpetic keratitis. Latanoprost should be avoided in cases of active herpes simplex keratitis because inflammation may be exacerbated. There have been reports of bacterial keratitis associated with the use of multiple-dose containers of topical ophthalmic products. These containers had been inadvertently contaminated by patients who, in most cases, had a concurrent corneal disease or a disruption of the ocular epithelial surface [see Patient Counseling Information (17.3)]. Latanoprost was studied in three multicenter, randomized, controlled clinical trials. Patients received 50 mcg/mL latanoprost once daily or 5 mg/mL active-comparator (timolol) twice daily. The patient population studied had a mean age of 65+10 years. Seven percent of patients withdrew before the 6-month endpoint. Less than 1% of the patients treated with latanoprost required discontinuation of therapy because of intolerance to conjunctival hyperemia. Eye Disorders: eyelash and vellus hair changes (increased length, thickness, pigmentation, and number); keratitis; corneal edema and erosions; intraocular inflammation (iritis/uveitis); macular edema, including cystoid macular edema; misdirected eyelashes sometimes resulting in eye irritation; periorbital and lid changes resulting in deepening of the eyelid sulcus. In vitro studies have shown that precipitation occurs when eye drops containing thimerosal are mixed with latanoprost. If such drugs are used, they should be administered at least five (5) minutes apart. The combined use of two or more prostaglandins, or prostaglandin analogs including latanoprost is not recommended. It has been shown that administration of these prostaglandin drug products more than once daily may decrease the IOP lowering effect or cause paradoxical elevations in IOP. There are no adequate and well-controlled studies in pregnant women. Latanoprost should be used during pregnancy only if the potential benefit justifies the potential risk to the fetus. It is not known whether this drug or its metabolites are excreted in human milk. Because many drugs are excreted in human milk, caution should be exercised when latanoprost is administered to a nursing woman. If overdosage with latanoprost occurs, treatment should be symptomatic. Latanoprost ophthalmic solution 0.005% is supplied as a sterile, isotonic, buffered aqueous solution of latanoprost with a pH of approximately 6.7 and an osmolality of approximately 267 mOsmol/kg. Each mL of Latanoprost ophthalmic solution contains 50 micrograms of latanoprost. Benzalkonium chloride, 0.02% is added as a preservative. The inactive ingredients are: sodium chloride, sodium dihydrogen phosphate monohydrate, disodium hydrogen phosphate anhydrous, and water for injection. One drop contains approximately 1.5 mcg of latanoprost. The distribution volume in humans is 0.16 + 0.02 L/kg. The acid of latanoprost can be measured in aqueous humor during the first 4 hours, and in plasma only during the first hour after local administration. Studies in man indicate that the peak concentration in the aqueous humor is reached about two hours after topical administration. Latanoprost, an isopropyl ester prodrug, is hydrolyzed by esterases in the cornea to the biologically active acid. The active acid of latanoprost reaching the systemic circulation is primarily metabolized by the liver to the 1,2-dinor and 1,2,3,4-tetranor metabolites via fatty acid Î²-oxidation. The elimination of the acid of latanoprost from human plasma is rapid (t1/2 = 17 min) after both intravenous and topical administration. Systemic clearance is approximately 7 mL/min/kg. Following hepatic Î²-oxidation, the metabolites are mainly eliminated via the kidneys. Approximately 88% and 98% of the administered dose are recovered in the urine after topical and intravenous dosing, respectively. Patients with mean baseline IOP of 24-25 mmHg who were treated for 6 months in multi-center, randomized, controlled trials demonstrated 6-8 mmHg reductions in IOP. This IOP reduction with latanoprost 0.005% dosed once daily was equivalent to the effect of timolol 0.5% dosed twice daily. A 3-year open-label, prospective safety study with a 2-year extension phase was conducted to evaluate the progression of increased iris pigmentation with continuous use of latanoprost once-daily as adjunctive therapy in 519 patients with open-angle glaucoma. The analysis was based on observed-cases population of the 380 patients who continued in the extension phase. 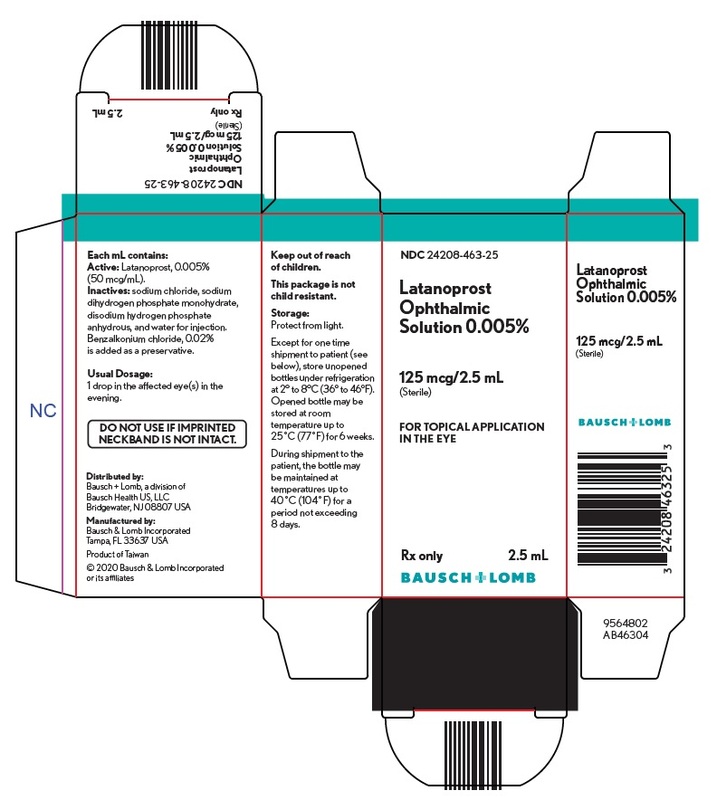 Latanoprost ophthalmic solution is a clear, isotonic, buffered, preserved colorless solution of latanoprost 0.005% (50 mcg/mL). It is supplied as a 2.5 mL solution in a 4 mL clear low density polyethylene bottle with a low density polyethylene dropper tip, and a turquoise high density polypropylene screw cap, and a clear PVC film with a single perforation. Advise patients that if they develop an intercurrent ocular condition (e.g., trauma or infection) or have ocular surgery, or develop any ocular reactions, particularly conjunctivitis and eyelid reactions, they should immediately seek their physicianâ€™s advice concerning the continued use of the multiple-dose container.